Opressed as I am by a devastating feeling of doom over the coming season I was encouraged by my fragrant husband to splash out on some new stock to try to get back that growing feeling again. He paid too, so that's alright. There are many new seeds, and I really didn't need any of them since I am overwhelmed with sad half-empty little packets rattling lonely and unloved around my storage boxes, but more of them later. I also secured some starts for Yacon. I did have the potential for these back in 2009 when a very kind correspondent sent me a plant and some eating tubers from Germany but an overly casual approach to winter storage stopped me before I ever got started and I've been too embarrassed to try again until now. 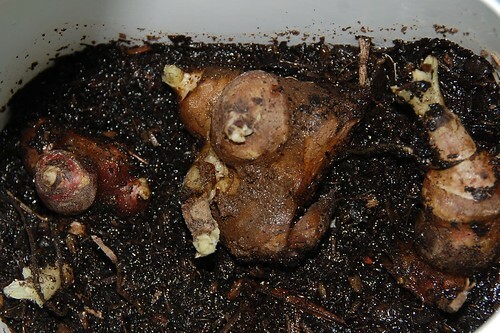 Here are the little babies, sent from Realseeds . The picture is a bit blurry and the tips a bit wet just after I'd unpacked and given them a drink but you can see all three have shoots and I'm hopeful for three good plants, two more than promised! The little bit of Yacon I've eaten was interesting enough. My worry is that like the Jerusalem artichokes the indigestible inulin will make us fart. However they seem a prolific crop and I quite like the idea of reducing them to a sugary syrup; vegans don't do honey and so all forms of self sufficient concentrated sweetness involve long simmering processes to concentrate the loveliness. Rhizowen picks his moment to harvest his yacon. Diamond Geezer does Little Holland House which looks absolutely stunning, although more arts and crafts than horticulture. Antipodesgirl is Pushing up Daisies and sounds nearly as cold as I am. I always find that devastating feelings of doom are swiftly banished by hard physical work and sunshine. Strangely the hard physical work is ineffective as a cure when carried out in rain, cold and gales. I concur - yacon does not make me fart and I suspect it will have an equally unimpressive effect on you. Inulin is a different matter of course.